Richard - Well, first of all you have to collect some samples. A paleomagnetist who studies these ancient magnetic signals will go out into the field with something like a modified chainsaw, drill into the rock, extract an oriented core - we know exactly what orientation it was taken out of the Earth - take that back to a laboratory. You then have to measure its magnetisation so we have extremely sensitive magnetometers, usually called the SQUID magnetometers - that Superconductive Quantum Interference Device. They’re able to detect the really weak magnetisation of these things. And we put that into what’s called a shielded room so we want to measure the magnetisation in the absence of the Earth’s field. So we build these shielded rooms; they’re big wooden structures lined with metal, a little bit like a Faraday Cage for magnetism. It shields out the Earth’s field so we can measure it in a zero field environment and see what the magnetic memory of that rock is. Chris - Does that tell you though how strong the magnetic field is because that’s the other important component isn’t it? Not just what direction it’s pointing in but also how big it is? Richard - Yes. So we get two fundamental pieces of information from these rocks. We can tell the direction of the field that was present when the rock erupted and cooled at the surface, but we can also tell how intense the magnetic field was. And we can trace both of those things back through time by looking at rocks with lots of different ages. Chris - You gave me a very nice sample when we came in - this little crystal and a very strong magnet. Chris - What was that to show? Richard - Okay. This shows why rocks are magnetic in the first place. And they’re magnetic because the contain a small proportion of a mineral called Magnetite. Chris - That’s this black crystal? Richard - Yeah. So what you have in your hand there is a beautiful octahedron of magnetite, which is an iron oxide, and what you’ll find that if you place it close to that little bar magnet it should strongly attract it to it. Chris - So this is basically a chunk of rock and I’m going to bring it close to the magnet and it just leapt off my hand and stuck to it. So basically, you’re recording tiny signatures written into minerals a bit like that one when you do your experiment? Richard - That’s right. Magnetite makes a very nice magnet if the particles are small enough. There’s this sort of Goldilocks zone for particle size so that piece you have in your hand is millimetres in size, that would be too big, it doesn’t have a very good memory. But if we shrink those particles down to just a few hundred nanometers, they become excellent magnets with a really good memory of the Earth’s magnetic field. Chris - And what have you learned about Earth’s geology, the evolution of our magnetic field, and the evolution of the surface of the Earth by actually studying these signatures? Richard - Well, paleomagnetic measurements have been absolutely fundamental in our discovery of how the Earth works. 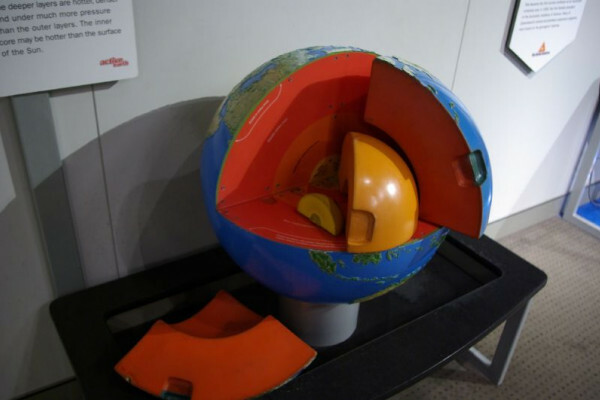 The theory of plate tectonics really came about through studying the magnetic signals in the ocean floor. And through studying the magnetic memory that you see there it was able to prove that the ocean was spreading and that continents were drifting across the Earth. Chris - Why the ocean floor? Why is that critical? Richard - During the Second World War, people mapped out the ocean floor magnetically in detail. They wanted to detect submarines so they needed to map out the magnetism of the ocean floor. And what they found were these magnetic stripes that go parallel to a ridge of volcanoes all the way down the centre of the ocean. The magnetic stripes are symmetrical either side of the ridge and what they track over time is this random flipping of the Earth’s magnetic field where the north and the south poles switch around. Chris - And they’re symmetrical either side of the ridge because what, the sea floors being born there and moving away? Chris - If it’s parallel to the ridge that’s because the sea floor was born on each side of the ridge at the same time so it inherited the same field at that moment in time? Richard - Exactly. So the magnetism is recorded as that new ocean crust in the centre of the ridge is cooled, and it would cause the present day field and then it’s pushed aside to both sides. And then later on the Earth field flipped and you get a different direction being recorded at the centre of the ridge. So that pattern of magnetisation was absolutely critical to determining that continental drift was real and that led eventually to the revolution of plate tectonics. Chris - Can we use the same trick, Richard, with not just samples from Earth but other planets? We have meteorites from Mars, for example. We have samples of lunar rock. Can we look at magnetic fields in those? Richard - Absolutely! A lot of the work we do in Cambridge is looking at extraterrestrial materials. So that could come from studying meteorites where we can look at the magnetic fields generated by asteroids early on in solar system. We looked at magnetism during the Apollo missions on the Moon and we were able to bring rocks back from the Moon. Chris - The Moon does have a magnetic field doesn’t it? Richard - It doesn’t have one now but it did have about four billion years ago. Early on its formation - yes. Chris - So where’s it gone then? Why’s the Moon no longer got one? Richard - Well, the Moon has a very small core. As in the case of Mars, the conditions have to be just right for that core to generate a magnetic field. When you have a smaller body that’s cooling quickly, the dynamo tends to switch off at some point. Chris - You mentioned earlier about the field flipping and things. People are often quite curious about this. Has that happened lots of times in the past and when’s it due to happen next? Should we be worried? Richard - We shouldn’t be worried. The Earth’s field has flipped many many times in the Earth’s past . It flips, on average, something like three to five times per million years. The last reversal was 780 thousand years ago. Life has persisted through all of those reversals so there doesn’t seem to be any majorly dangerous impacts of having the Earth’s field flip. The main thing you’ll notice is that mobile phone signals will get worse when there’s a flip. Previous Can birds see Earth's magnetic field? Next Why is the earth's magnetic field important? Bacterial compasses - can creatures detect magnetic fields?